Just thought I'd throw some ideas out there (of course not kowing what GCT have in store for us in the future) but how about some of these as ideas for the Temple? I do think the Temple would benefit from something/someone that gave them a ranged attack - like a simple archer? Would love to have monk riding a Tiger into battle! That would look awesome. Would it be too bad to also suggest a Panda - doesn't have to be like film character! I agree ... but mischevious or not he HAS to be for the Temple ... he's escorting a Bhuddist priest! We kind of already have farmer and monk type/looking characters (although these characters are a "bit" different!) but Monkey who can "ride on clouds, change shape, multiply himself ..." would be excellent! I think I see three Yokai there! Shape shift monkey, shape shift pig and shape shift...... fish? maybe something amphibious like a crocodile. Thoughts on possible special traits. May need a new trait for the pig. If a model is in LoS with this model and not btb with another model it must declare a charge against this model. Now there's a great thought/trait "nackers" - 'Delicious' .... think it should be combined with Impetuous. 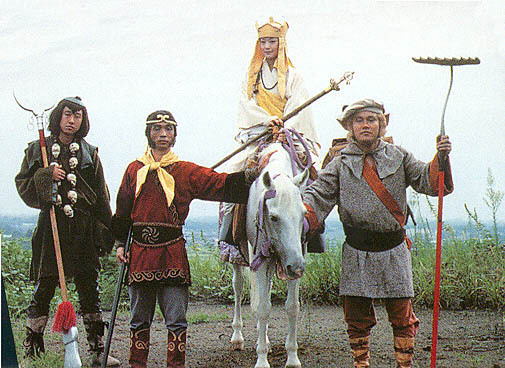 lol thats an awesome idea for pigsy, but remember "monkey" was the monkey king for a long time before tripitaka trapped him. he doesn't have to be with the monk. check out forbidden kingdom the film the monkey king is awesome. also the new cult lady Harionago is in it. Monkey would definitely be kami not yokai, he tricked his way into being a God after all! But not a Kami in game turns, I think, Greeny. That'd be weird. That's a good point, of course. How about a tattooed man? Dice cups are the new O.P. However, this could verge on the elemental 'kiho' that Temple already has, but as a rules aesthetic I like it. Would produce some nice freehand ideas! I think tattoos would suit another faction better (perhaps a certain organsised-crime-themed faction), mainly because of the taboo associated with them in the far eastern nations (due to their association with certain real organised-crime factions (seriously, there are many places in Japan (not sure about china/etc) that won't let allow you to enter if you're inked). Fluff-wise the person could have 'living' tattoos, that move around his/her body etc and grant him special powers (Does anyone here ever read SCP Wiki?, got the general idea from there). As for temple, what about a character based on Momotaro (Peach Boy)? Leigen_Zero - Momotaro is an excellent idea. Just read that story about him. The statue in that thread looks great. Get GCT to model that!! To give the Temple a character, animal themed that has some history of defeating the Oni ... awesome!